(PRLEAP.COM) Park City – UT – www.e-janco.com – Janco's has just released it's 2018 IT Salary Survey (https://www.e-janco.com/salary.htm) and CIO Management Toolkit (https://www.e-janco.com/CIO_Management_Toolkit.html). At the same time, Janco has completed its analysis of the latest BLS data. IT salaries on a year-to-year comparison have risen 3.5%. The median salary (for the positions surveyed) has gone from $82,072 to $90,115. Janco forecasts that on average approximately 7,000 new IT jobs will be created each month in 2018 resulting in 84,000 new domestic IT jobs. The CEO of Janco Associates, Inc., Mr. M. Victor Janulaitis said, "The recent tax legislation and reduction in regulations has created a positive outlook for job growth in general and Information Technology in particular. If jobs will be brought back to the US, a re-vamped immigrations is legislated, and infrastructure spending increased that should result in a significantly improved economic picture." He added. "With the all of this, there will be a greater need for US-based IT resources. IT hiring and salaries will be up." All of that comes at a time the labor statistics from the BLS show an economy that has over 96.2million individuals not even in the labor force with an unemployment rate that is 4.1%. Those 96.2 million people are a resource to provide the capacity for growth. 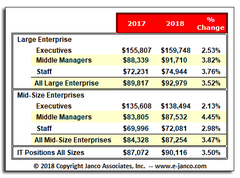 Janco interviewed over 117 CIOs in the last quarter as part of it's 2018 IT Salary Survey process ( https://www.e-janco.com/salary.htm ). Janco's CEO said, "CIOs interviewed after the passage of the recent tax legislation are optimistic that there will be more incentives for increased IT spending and hiring. " He added, "SMBs are actively looking for experienced managers who will be able to manage the increased technology initiatives that they feel will be stated in the next two quarters." The CEO added, "In reviewing the last 24 months of data on new IT job creation, it is very clear that there has been a downward bias in the number of new jobs created." He added, "In contrast from recent interviews with 86 CIOs and CFOs we found that they have budgeted for more growth in 2018. Most of the C-level executives interviewed are comfortable with the overall direction of the economy and prospects for new IT jobs. This also was reflected in their planning for greater hardware/software acquisitions and major application development and implementation. Many of these executives feel they will have to come back and get more monies in the third and fourth quarters." The CEO also said, "Even before the recent tax bill, many CFOs were not adverse to incremental spending for IT related activities that have operational support and have a good ROI." Major findings of the 2018 IT Salary Survey are: 1) Over the long-term compensation for IT executives have fared better in large companies than mid-sized companies. 2) The greatest increases have been at the middle manager levels in mid-sized companies with an increase of 4.45% - most of which can be attributed to performance bonuses and the hiring of significantly more qualified individuals earlier. 3) In the last two quarters of 2017, middle management positions in IT organizations of SMB's had the greatest demand for new hires. Companies were gearing up their internal US-based IT organizations pushing IT salaries up by 4.45% (from $83,805 2017 to $87,352 at the start of 2018). 4) IT compensation for all IT Professionals increased by 3.5%. 5) The IT job market is poised for expansion. We predict that the IT job market will grow by 84,000 net new jobs. 6) Median CIO tenure has risen by a month to 4 years and 7 months as fewer CIOs moved on to new positions. In addition, retirements of baby boomers seem to continue at the same rate as the prior year. 7) Large organizations are planning to beef up their middle management as those enterprises focus on Big Data, Blockchain and Smartphone and tablet connectivity. In addition, many CIOs in large enterprises are now getting closer to retirement. Succession planning and promotion of Millennials into those roles is becoming a priority. 8)Positions in highest demand are associated with security, training, large data center management, big data, distributed/mobile system project management, and quality control. and 9) Onshore outsourcing and H-1B visa jobs have peaked. The America first campaign has resulted in more infrastructure functions being moved in-house. The full 2018 Salary Survey can be found at https://goo.gl/tg22AQ. The CIO Management Toolkit includes the Security Template, How To Cloud/Outsourcing, Full set IT Job Descriptions, IT Job Classification System, Latest IT Salary Survey, Interview/Hiring Guide, Infrastructure Policies/Forms, Threat Assessment Tool, and the BIA Tool. 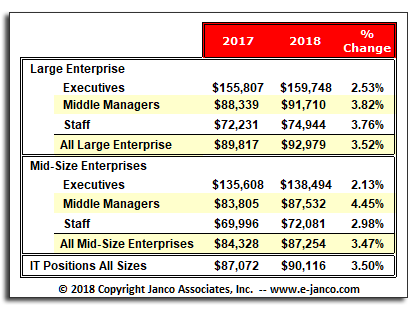 Janco is an international consulting firm that follows issues that concerns CIOs and CFOs and publishes a series of IT and business infrastructure HandiGuides® and Templates including a Disaster Recovery/Business Continuity Template, Security Template, and it's semi-annual IT Salary Survey.